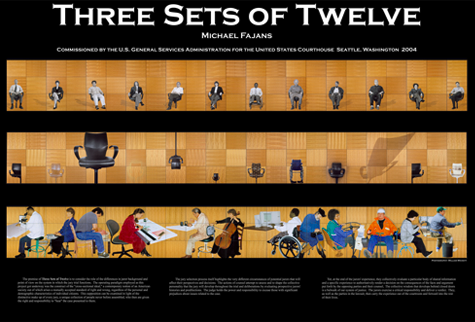 The Three Sets of Twelve poster depicts the murals installed on three floors of the US Federal Courthouse in Seattle, Washington. The three blocks of text are the artist statement by Michael Fajans. This high quality poster is suitable for framing. The dimensions are 26 1/2" x 39". Posters are available for $85.00, including shipping in a 3 inch diameter tube to any US location. To order, contact Cider Press Media.